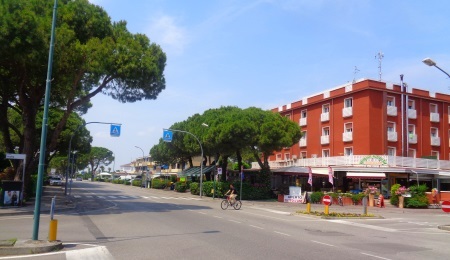 Most importantly, Cavallino is a tourist town on a peninsula south of Lido di Jesolo, directly opposite Venice. During the day you can reach Venice from Punta Sabbioni, a hport near the town of Cavallino, by ferry twice an hour (travel time 30 minutes). Cavallino has an extremely beautiful beach that is over 10 km long. Most of the millions of tourists who visit Cavallino every year combine a beach holiday with a city trip in the form of day trips to Venice. In addition to Venice, some other interesting islands can also be reached by ferry hourly from Cavallino-Transporti. Many holidaymakers stay overnight on campsites. Cavallino has the largest campsites in Europe. The place Cavallino is on the peninsula Litorale del Cavallino south of Jesolo (see map below). The municipality of Cavallino-Treporti forms about the southern half of the long tongue. On the Adriatic side there is a 10 km long beach of the best quality. It consists mainly of golden yellow, fine sand (see picture above). The majority of the many millions of tourists who visit the peninsula every year come in summer and stay overnight at one of the campsites. Many campers travel by motorhome directly from Germany to Veneto. But quite a few also come by plane and rent a cottage, holiday flat or holiday home in Cavallino. Most campsites also rent out permanent holiday accommodation. A good overview of hotels and holiday apartments in Cavallino-Transporti can be found on the website Booking.com. The Agriturismo Dolceacqua is an accommodation in Cavallino that many holidaymakers like very much. It is a tastefully restored farmhouse. The pleasant atmosphere and the tasty breakfast at the Agriturismo Dolceacqua are always praised (more information on this link). The popular Residence Vecchio Faro in the northern municipal area has a great holiday apartment in different sizes, also larger ones for 5 to 7 persons (more info). Cavallino-Treporti it is elongated place along a beautiful beach. The actual town centre consists of a through road (see picture below) and settlements to the left and right of the wide road. The beach is only 100 meters away. There are supermarkets, several good pizzerias along the main road and so on. However, most hotels and camping sites in the municipality are scattered, mostly close to the more than 10 km long beach. The public transport with buses is well developed. 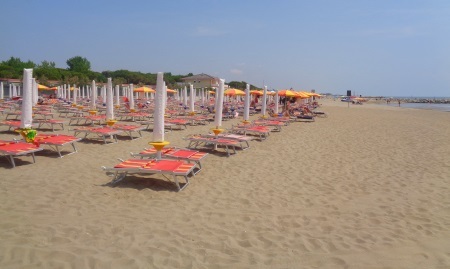 During the day there are buses every half hour to Punta Sabbioni and in the other direction to Lido di Jesolo. Tickets are not available in the bus, but in one of the tobacco shops. In Punta Sabbioni there is a ticket office at the bus stop, in Lido di Jesolo there is a large, modern bus station with ticket counter, toilets, cafe, etc. From Lido di Jesolo (more info) there are frequent bus connections to Marco Polo Venice airport, Mestre and on to the bus station in the old town of Venice. There are two ferry ports in the municipality - Punta Sabbioni and Treporti. Most tourists use the port of Punta Sabbioni to get to Venice. The buses from Lido di Jesolo via Cavallino end directly at the ferry port (2 times per hour per day, tickets depending on distance maximum 3 euros in 2019, travel time from Cavallino about 15 minutes). Most buses have a direct connection to the ferries. Tickets for the ferries are available at the harbour in Punta Sabbioni. One should consider whether a time ticket makes sense for the ferries (for example: 24 hours 20 Euro, 48h 30 Euro, 72 h 40 Euro or 1 week 60 Euro). These tickets are valid for most ferries in and around Venice (not for the ships to the airport) and for the buses in Mestre and on the island Lido di Venezia - but unfortunately not for the buses between Punto Sabbioni and Cavallino or Lido di Jesolo. From Punta Sabbioni there are usually two ferries per hour to Venice (jetty about 200 meters from central Piazza San Marco). Another ferry runs about every hour from Punta Sabbioni to some interesting islands like the glass island Murano or the island of the colorful houses Burano. At the ferry port of Punta Sabbioni there are gigantic parking lots. Thousands of commuters who work in Venice and tourists park here. Almost everyone takes one of the big ferries to Venice. The parking lots of Punta Sabbioni are chargeable and cost 5 Euro for one day (January 2019). Those who drive directly to Venice by car pay considerably more (see our page Parking in Venice). Agriculture: The municipality has about 14,000 inhabitants. Not all live from tourism. It is a very fertile area. A lot of vegetables are planted, especially in greenhouses. The large municipal area has an area of 4,400 hectares. Location: On one side (north) Cavallino-Transporti borders the lagoon of Venice, on the other side the Adriatic Sea. On the Adriatic side are all beaches, in the lagoon bathing is not popular. Neighborhood places: Since the village is at the end of a peninsula, there is only one real neighbor community. This is Jesolo. In the water, Cavallino-Transporti also borders on the city of Venice. Numbers: According to some statistics, Cavallino-Transporti is one of the largest tourist resorts in Italy. There are at least 20 campsites. According to one statistic, every summer about 5 million tourists come to Cavallino and its surroundings. This would make Cavallino the second largest seaside resort in Italy. Only the famous Rimini a few hundred kilometres further south would have more tourists. In winter, however, there is little going on, it is a classic summer beach resort. Place name: The name Cavallino comes from the historical horse breeding in the area. Cavallo is the Italian word for horse. Origin of holidaymakers: Most holidaymakers come from Italy and Germany. But also many tourists from the Netherlands, Belgium, Austria, Switzerland and Denmark can be found in this mega tourist resort near Venice.